BOSTON – Every year, the holiday season is ushered in on the grand finale of one of sport’s most beloved treasures: The World Series. And what better way to celebrate baseball’s end of year curtain call than to have one of today’s greatest gifts to music – independent gospel recording artist and The Voice Season 3 finalist, Michelle Brooks-Thompson, serenade an anticipated world-wide television audience of over one billion with an electrifying rendition of the “God Bless America” for the series’ L.A. Dodgers vs. Boston Red Sox opener! The award-winning artist (featured in People Magazine’s October 2018 Special Edition as a Voice finalist), has shared the stage with gospel greats such as Donnie McClurkin, James Fortune and Zacardi Cortez. But it is her extraordinary voice and striking presence that have captivated audiences, making her rich vocals synonymous with delivering “God Bless America” as well as the National Anthem at countless major sporting events for the NBA, NFL, MLS and of course – MLB, and television (TBN’s Praise the Lord and other national programs ) as only she can. Michelle’s unique ability to be simultaneously transparent and entertaining, synchronizing her talent with pure heart and soul, has ignited an overwhelming demand to share her gift across countless major platforms; one would be remiss in missing the beginning of her rise to stardom. Tuesday, October 23, 2018, the world will be settled on sofas or finding a spot at a watch party venue, donned in memorabilia supporting their favorite team, anticipating a win, saving their voices to cheer either the Dodgers or the Red Sox on to victory. 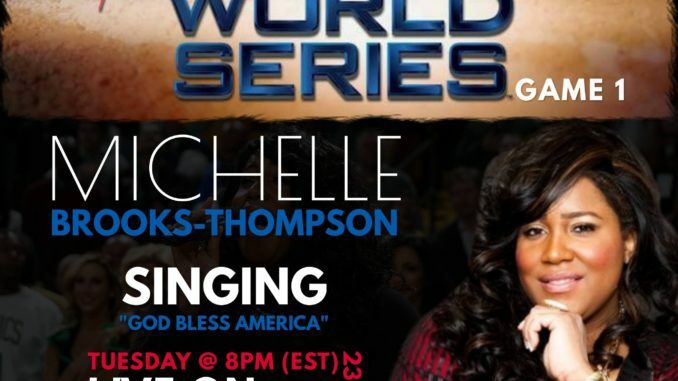 The audience will sit down for a game, but their souls will be pricked when the voice from The Voice – Michelle Brooks-Thompson, steps up to the microphone and begins to sing….and a new star shall rise. Make sure you reserve your seat.